UDM Downloads > Daniusoft Video to Pocket PC Converter! Daniusoft Video to Pocket PC Converter is an all-in-one and fast Pocket Video Converter software which can convert MOV to WMV, Convert MP4 to WMV or other popular video formats: AVI, MPG, MPEG, 3GP, WMV, ASF, DAT, MOV, FLV to Pocket PC WMV, AVI and rip video audio to Pocket PC MP3, WMA. 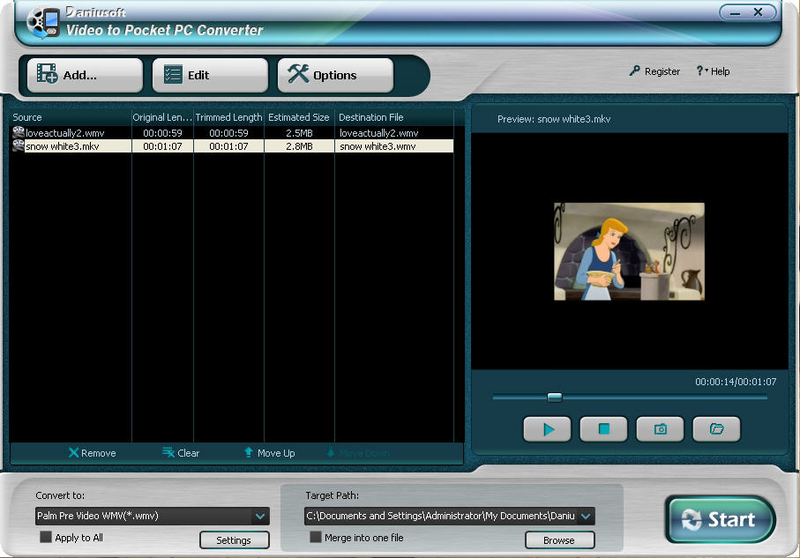 This multifunctional Pocket Video Converter allows you to set many video editing functions: video crop, movie trimming, and video effect adjustment. You can also set encoding parameters (including solution, bit rate, frame rate, brightness, saturation, and aspect ratio) to get the best video quality to Pocket PC. This Pocket Video Converter Software is so easy-to-use that whether you are an experienced user or a beginner, Convert Convert MOV to WMV, Convert MP4 to WMV, Video to WMV or other supported video is just a breeze.With this powerful Pocket Video Converter, you can enjoy any videos on your Pocket PC. Just free download it to have a try! Key features 1. Pocket Video Converte - Convert MOV to WMV, Convert MP4 to WMV or other popular video formats: AVI, MPG, MPEG, 3GP, WMV, ASF, DAT, MOV, FLV to Pocket PC WMV, AVI; 2. Pocket Audio Converter - Rip video audio to Pocket PC MP3, WMA; 3. Support Batch Convert Video to Pocket PC and merge several titles into one file; 4. Crop Video - Crop off the black edges of Video, Set the Screen by Keep original/ Full screen/ 16:9/ 4:3; 5. Trim Video - Trim any segment of your Video by set the Start time and End Time; 6. Set Video Effect - Convert Video to Pocket PC with flexible video and audio settings: adjust Brightness, Contrast, Saturation, Volume; 7. Support sound normalization - you can set volume of output files as you wish; 8. Capture picture - Capture your favorite pictures from your Video and save to your computer; 9. Easy to use - Very easy-to-use with only a few clicks to complete the conversion and you can preview all the process.